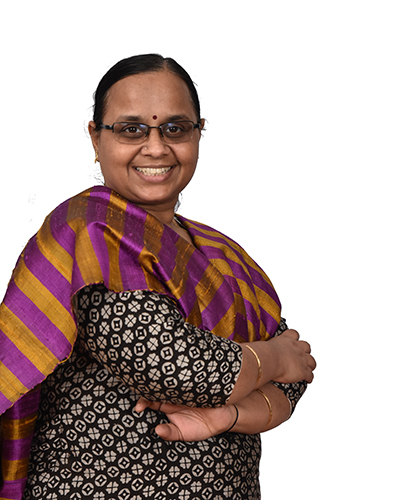 Kausalya holds MSc and M.Phil degrees in Mathematics from the University of Madras. Even as a Masters student, she was chosen by her teachers to deliver lectures owing to her conceptual clarity and excellent communication skills. Immediately after her post graduation, she joined the Department of Mathematics, Stella Maris College, Chennai as a Lecturer. After completing her M.Phil, she taught for a couple of years at the Ethiraj College for Women in Chennai, Tamil Nadu. She also worked with a career planning and mentorship institute in Chennai where she contributed to the Mathematics Course Development and co-authored a Mathematics guide for senior secondary classes. Her passion to engage with school children brought her back to teaching high school Mathematics. Between 2005 and 2015, she was engaged in study of the Philosophy of Free Progress as elucidated by Sri Aurobindo and The Mother. 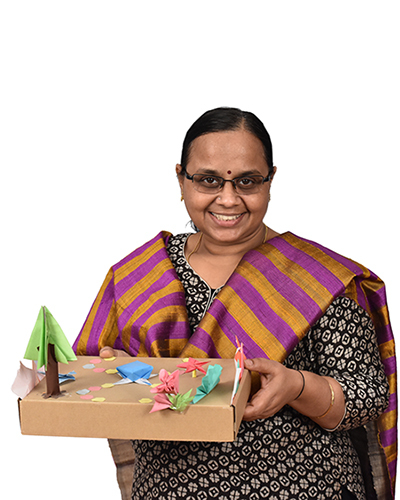 Kausalya has had long interactions with senior practitioners of the Free Progress Approach, which further fuelled her search for an integrated, child-centered approach in project-based learning. Kausalya volunteered as a Mathematics Facilitator in Mirambika Free Progress School, New Delhi between 2010 and 2015. She successfully developed and imparted learning through activities and creating games with children. Kausalya is also trained in Classical Carnatic Vocal Music from the renowned guru ‘Ganasaraswati’ Smt D K Pattammal. At the Mirambika Free Progress School, New Delhi, Kausalya also trained children to perform folk and classical pieces in Indian vernacular languages. She was also part of a team of teachers to train young teacher-trainees in Mathematics, Music and Sanskrit Chanting. Since 2015 December, Kausalya is a teacher at the Mahatma Gandhi International School, Ahmedabad. At MGIS, she has been an enthusiastic and passionate practitioner of the unique pedagogy. She is fascinated by using tangrams as a powerful tool for learning a diverse range of concepts in mathematics. Presently, she is in a role of a class–initiator for grade 9 with the Flea Market project. She is also a part of the team in the first year of MYP, contributing to learning of Hindi and logical abilities (mathematics) through the Radio-show project. Star project is “Designing a container for a dry snack” that enabled children to estimate the sizes of the containers to hold various quantities of a snack. Through this project, children also learnt about measurements, nets, 3D shapes, volume as well as the surface areas of the paper they used. Designing a container and creating a healthy snack for our school cafe with grade 7 students. Understanding the working of fractions through tangrams for grade 6. Setting up a stationery market place in the classroom to carry out the four operations in numbers for grade 4.